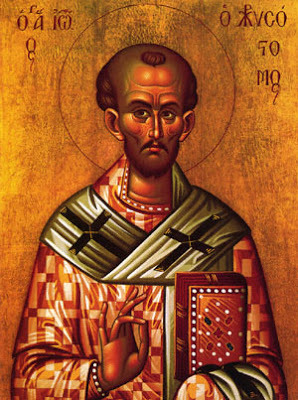 On all but a few Sundays of the year, we celebrate the Divine Liturgy of St. John Chrysostom. This coming Wednesday, we will celebrate his memory as one of the Three Holy Hierarchs together with Sts. Basil the Great and Gregory the Theologian. And today we remember the return of his relics to Constantinople in 438, thirty years after his death in exile due to his prophetic criticism of the abuses of the Empress Eudoxia. St. John plays such a prominent role in the history of the Church because his ministry combined bold preaching, faithful biblical interpretation and doctrinal teaching, asceticism, rigorous oversight of the clergy, liturgical reform, love for the poor, and fearless opposition to evil in high places. A very popular preacher in Antioch where he was not afraid to make clear the tension between God’s requirements and popular forms of behavior, he was essentially forced to become the Archbishop of Constantinople, the capital city. St. John tightened discipline in the church there and continued to speak the word of the Lord without compromise, which is a dangerous thing to do around powerful people. He was first deposed and banished for offending the empress and certain church leaders, but was then allowed to return after she took an earthquake to be a sign from God. Nonetheless, St. John denounced the celebrations surrounding the dedication of a silver statue of the empress near his cathedral. She exiled him again, and he died as a result of the very rough treatment he received. During the reign of the empress’ son Theodosius the Younger, St. John’s relics were returned to Constantinople. St Proclus had preached a sermon praising St John in which he said, “O John, your life was filled with sorrow, but your death was glorious. Your grave is blessed and reward is great, by the grace and mercy of our Lord Jesus Christ, O graced one, having conquered the bounds of time and place!” At the request of the people, St. Proclus got the approval of Emperor Theodosius to bring St. John’s relics back to Constantinople. But those sent to carry the coffin literally could not move it until a letter of apology from the emperor was placed on it. It may be hard for us to process such an astounding account, but we must remember that those who have died in Christ are alive in Him. We are surrounded by a great cloud of witnesses, and we look for the resurrection of the dead and the life of the world to come. Though it is completely beyond our rational understanding, we encounter in these miraculous events a sign of our salvation, a foreshadowing of the resurrection of the body, and a reminder that there is one Church in heaven and on earth. Think for a moment about what kind of person God has magnified in these ways in the memory and experience of the Church. St. John Chrysostom is not someone who made it easy on himself or on others. He did not water down the faith so that it would fit easily with a conventional life. He did not seek power, fame, or wealth. He was not afraid to give his own life for the sake of God’s kingdom or to go against the dominant trends of his society. His homilies still speak to us with clarity and challenge us to live a holy life in a world that really has not changed that much morally and spiritually since his day. Too often, we remember saints only with a few minutes of chanting and reading or with a good meal. There’s nothing wrong with those sorts of commemorations, but they should be just the beginning. For the cloud of witnesses that surrounds us is not simply an interesting part of our religious calendar, but a vital dimension of our life in Christ. We are members of the same Body with them. We benefit not only from the fine example that they set and their contributions in theology, liturgy, and hymns, but also from their ongoing prayers on our behalf. If you doubt that, read the book of Revelation with its portraits of so many martyrs around the throne of God who beseech Him on behalf of those suffering persecution. Those whose lives have so clearly manifested the holiness of God are not simply dead and gone, but alive in Christ, worshiping Him constantly and praying that we will join them. Of course, we do not join them only after our own death, but already now in the worship of the Church. The Divine Liturgy is our collective participation in the Heavenly Banquet together with all the saints and the heavenly host, but the Christian life does not end there. As those who have entered into the worship of heaven and been nourished by the Body and Blood of our Savior, every dimension of our lives should manifest the holiness of God seven days a week. No, we cannot all do everything and no two people are totally identical. But the even as St. John displayed faithfulness in so many ways, we too are called to offer every bit of who we are to the Lord. In other words, we cannot pretend that holiness is for this part of our lives, but not for that part. We cannot compartmentalize who we are, for Christ came to bring us—body, soul, and spirit– into His. The Lord wants us all to become incorrupt, to be healed from the decay of sin and evil in all its forms. When we proclaim belief in the resurrection of the dead and the life of the world to come, we surely want the Lord to remember us as whole persons in His Kingdom, and that includes every dimension of who we are. We cannot understand it rationally, but eternal life encompasses the whole person and even the whole creation. If we want an example of how to participate already in that all-encompassing blessedness, we should look to St. John Chrysostom. He did not keep true Christianity confined to services, sermons, or what was socially acceptable; instead, he lived out what he taught and believed with integrity. He staked his life on faithfulness to Jesus Christ, Who has magnified him in the memory of the Church. Let us all follow his example of obedience to the Savior in thought, word, and deed, for that is how we too may become living icons of His salvation together with all the saints who have gone before us.